manufacturing of pet products while their clients can sell them using their own brand. Private Label Pet Foods is a new brand separate from their main pet food business. They wanted a modern, friendly, and welcoming look for their new website. With challenging design requests, we had to create various set of designs to test their tastes. Also, one of the challenges is content. They don’t have contents ready yet so the project was a fun challenge for our design team. We had to undergo extensive research and brainstorming to strategically plan which sections to incorporate. 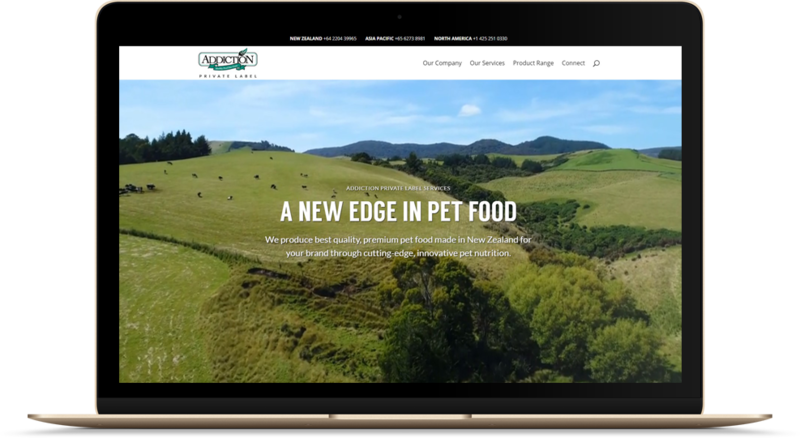 Our creative team created visually-stunning web designs centered around their manufacturing plant located in New Zealand. The new website was designed and crafted from the ground up to reflect their mission of high-quality standards and innovation. We incorporate high-quality stock photos, product packagings, and videos throughout the site. We synthesize creativity and interactivity to bring their vision to life. Do an extensive research to understand which strategies and technologies to use to perfectly craft the new website based on Jonathan's vision. Using the details and branding guidelines we have, we design the site's pages and save it on InvisionApp for rapid prototyping.